This NASA photo of the LADEE moon orbiter as seen by the Lunar Reconnaissance Orbiter identifies key parts of the LADEE spacecraft (geometrically corrected). Image released Jan. 29, 2014. In a moment of lunar synchronicity, a moon-orbiting NASA probe spied another one of the space agency's spacecraft from its spot in orbit. The Lunar Reconnaissance Orbiter caught sight of NASA's LADEE moon dust probe as both spacecraft sped around the moon at nearly 3,600 mph (1,600 meters per second) on Jan. 14. LRO and LADEE were a mere 5.6 miles (9 kilometers) apart as the photo was taken. NASA's LADEE moon dust probe (circled) is photographed by the agency's powerful Lunar Reconnaissance Orbiter in this image released on Jan. 29, 2014. The image, taken on Jan. 14, shows LADEE from a distance of 5.6 miles (9 kilometers) away as the two spacecraft passed each other as they orbited the moon. Both spacecraft are orbiting the moon with velocities near 3,600 mph (1,600 meters per second), so timing and pointing of LRO must be nearly perfect to capture LADEE in an LROC image. "As planned at 8:11 p.m. EST on Jan. 14, 2014, LADEE entered LRO’s Narrow Angle Camera (NAC) field of view for 1.35 milliseconds and a smeared image of LADEE was snapped," NASA officials wrote in an image description. NASA's LRO has a history of spotting other spacecraft from orbit. In December, the probe photographed China's first moon lander and rover — called Chang'e 3 and Yutu respectively — on the lunar surface, marking the first soft-landing on the moon since 1976. 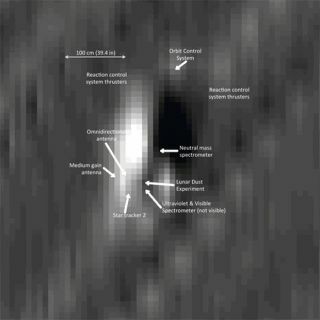 This NASA graphic shows an artist's view of NASA's LADEE moon dust probe overlaid on a photo of the actual spacecraft captured by NASA's Lunar Reconnaissance Orbiter (geometrically corrected). Image released Jan. 29, 2014. LADEE took measurements before and after the Chinese touchdown to see how the landing impacted the lunar dust environment from its post in orbit. "LADEE's science instruments gathered data on the dust and gas species before and after the landing to provide the science team with a comparison," Rick Elphic, LADEE project scientist, wrote in a mission update. "The Neutral Mass Spectrometer (NMS) was running in a mode that would allow it to monitor native lunar atmospheric species, as well as those resulting from Chang'e 3's propulsion system." LADEE launched into space on Sept. 6, 2013 to investigate lunar mysteries from orbit around the moon. The loveseat-size spacecraft is designed to probe the thin lunar atmosphere to gather data about the moon's dusty environment. The spacecraft is also going to investigate moon dust mystery dating back to before the Apollo program. The $504 million LRO probe launched to space in 2009 carrying seven science instruments with it. It is about the size of a Mini Cooper car and orbits about 31 miles (50 km) above the moon's surface.